Brickwood, the eatery on Wood Street has widened their menu forte and the very proof of it is the new menu. From salads to appetisers and pastas, there’s more than one reason to have a meal with your squad here. There’s a completely new section added to the menu – salads. Keeping in mind the sultry heat outside, they add a dose of freshness to your palate. The Feta Melon Salad is a riot of colours with melons, watermelons, rocket leaves and a bit of feta spread on top. It will quench your thirst and fill you up in a nice way. If you don’t want the cheese, go for the Mixed Melon Salad, minus the Feta. Or try the Fruit Cream and Cream & Mango salads. The appetiser section includes new additions like Paprika Chicken (smoky roast chicken served with a creamy dip) and Garlic Butter Mushrooms (wild mushrooms tossed lightly with garlic, butter and parsley). There’s creamy pastas and risotto too! Choose among Penne Al Fungi (penne in a wild fungi cream sauce topped with sautéed mushrooms), Spaghetti Alla Brickwood (spaghetti with loads of garlic, olives and sundried tomatoes with some wine and extra virgin olive oil) or Sicilian Spaghetti (with homemade chicken sausage in a chilli tomato sauce). Their Wild Mushroom and Truffle Oil Risotto is worth drooling over for sure! 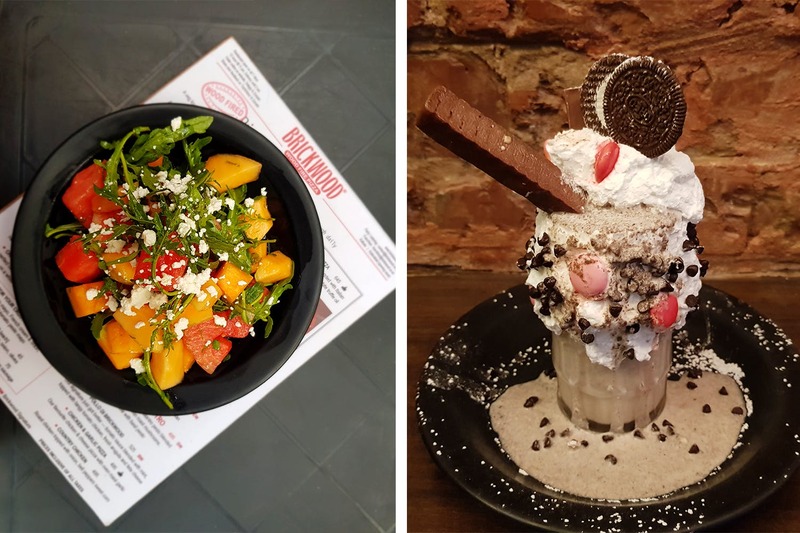 One huge attraction at Brickwood has been their freakshakes. The new menu packs one in as well and it’s called the Candy Overload Freakshake. Go bonkers as you dig in this Oreo shake loaded with whipped cream and choco chips. The shake is topped with Snickers, KitKat gems and Oreo cookies. A meal for two would be approximately INR 1,000.